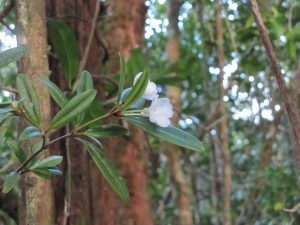 A Rhododendron collected in Malaysia in 2010 by RBGE scientist Dr Peter Wilkie has been described as new by colleagues at the Forest Research Institute Malaysia (FRIM). Rhododendron chamahensis Rafidah, published in the journal Blumea, was collected during a three week collecting trip to Malaysia’s fifth highest mountain, Gunung Chamah. A type specimen (the specimen used to describe the new species) has just arrived at RBGE and is currently being mounted for incorporation into our herbarium.